These apartments are privately owned and carefully selected to provide easy access to both skiing and other resort facilities. There are two smaller flats to sleep 4 and a one double bedroom flat plus a separate bunk bedroom to sleep 6 in the Val Claret area of Tignes. We also have a flat close to the Funival in Val d'Isere to sleep 7, Property Number 9854. All apartments are very close to the lifts, including high speed underground railways. Hameau du Borsat is ski in / ski out, while the Chalet Club flats are connected to the Funicular and Col de Fresse high speed chair linking with Val d'Isere by a short rope tow. We also have Property Number 9854 in Val d'Isere, a well equipped apartment with dishwasher, fridge, four ring halogen hob, microwave oven/grill, slow cooker, kettle, radio, CD player, double bedroom, bunk bed room and two divans in the living room which sleeps three, all with duvets. Bathroom with shower and separate toilet. Parking available under the building. Tignes - Val Claret, Hameau du Borsat - Sleeps 6: The Hameau du Borsat flat in Tignes Val Claret has just been completely refurbished to Tignes '3 Pillows' standard with all decor, furnishings and fittings replaced to a very high standard. The living room has a divan (which converts to a double or two single beds). 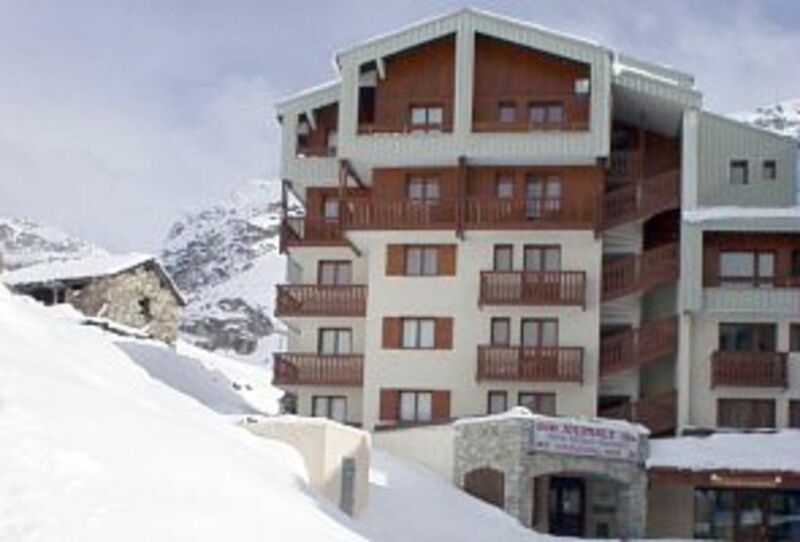 Tignes - Val Claret: In the Chalet Club, we have two studios to sleep up to 4. There is a pair of bunk beds and a wardrobe in the entrance and a divan which converts into a double or two single beds in the living room. Flat 51, which has recently been extensively refurbished, has a double aspect balcony facing South and West, while Flat 24 lacks a balcony, but offers extra space inside. There is more information at our website, please ask us for the link. I bought this property because of the great location and fantastic views from the balcony. It is rented out to pay the mortgage and, because we use it a lot ourselves, it is maintained to a high standard. Private WiFi available for a small supplement. Newly refurbished with a glass shower screen and large heated towel rail. Secure underground parking at Parking du Borsat available at extra cost. Private WiFi including the four UK iPlayers available for a small supplement. Summer only - book via Tourist office. Hire shop with 30% discount to our guests. Myself and a friend stayed here for 3 weeks at the end of the season. Its in a great location, close to the lifts and shops. The only thing stopping it from getting 5 stars is the lack of a balcony. Appartement très propre et bien adapté pour 4 personnes. Au pieds des pistes. Our flats are in Val Claret, the highest point of Tignes at 2,200m . There is easy access to Val d'Isere's skiing from Val Claret by either of two high speed 6-person chair lifts. The Grande Motte glacier can be reached by the underground 'Funiculaire' and offers excellent summer and autumn skiing. WiFi is available for a small supplement. It includes access to the four UK iPlayers. Ski: Val d'Isere and Tignes share what is probably one of the top five ski areas in Europe with a fantastic range of 200+ runs for everyone from beginner to expert serviced by 120 lifts. There is now a good choice of ski schools and this competition has certainly raised standards. Tignes is the summer skiing capital of Europe but there are many other activities here and at Val d'Isere including golf, tennis, mountain biking, fishing, white water rafting, sailing, etc. Val d'Isere and Tignes are on the edge of the Vanoise National Park and only 40 miles from the Little St Bernard pass into Italy which makes a great day out.